Houghton, P. & Worroll, J. Forest School is founded on a philosophy of nature-based play and learning that encourages children to develop confidence and self-esteem. This book will get your kids outside, making and building in the real world (instead of on a computer screen!). 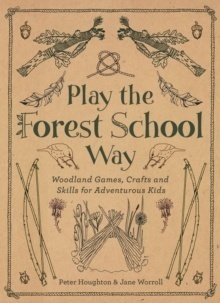 It is the first book to share Forest School games, crafts and skill-building activities with families and friends, its magical illustrations and simple instructions drawing children easily into a world of wonder. Authors: - Houghton, P. & Worroll, J.